Our EUR/USD is not looking great at the moment as sellers pushed this pair below the 50 SMA. The US Dollar has gained some ground against the major currencies. This has pushed NZD/USD to some interesting levels. We actually just took a trade in this forex pair. We opened a buy forex signal in NZD/USD a few minutes ago and we are already 5 pips in profit. If you look at the hourly chart, you can easily spot the 100 smooth moving average. That moving average has been providing support all day. But, the main chart setup that persuaded us to open this signal is the H4 timeframe. 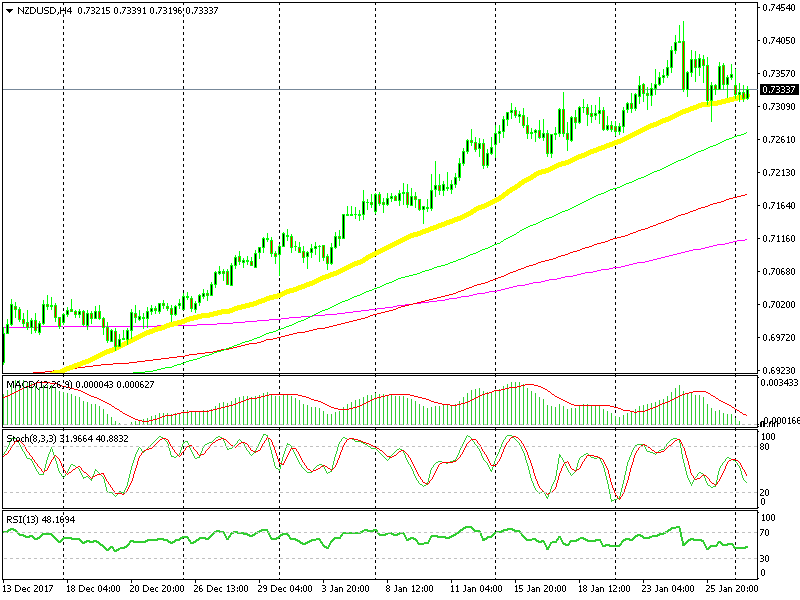 As you can see above, the 50 SMA (yellow) has been providing support for NZD/USD over the last 8-9 weeks. This moving average has kept the uptrend in place. Now we are back down at this moving average which is providing support again. The stochastic indicator is almost oversold, which means that the retrace lower is almost over. The H1 chart is already oversold and heading higher. Though, at the moment, the USD is still advancing against the Euro and the JPY. But, NZD/USD is not moving lower. This sort of price action is a good sign. We are in the right direction with our NZD/USD signal.